A former socialite continues to live life on the edge. 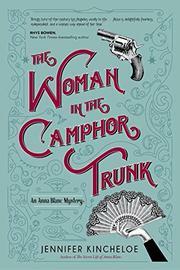 Anna Blanc has given up wealth, security, and a stuffy fiance to become a crime solver. If you think that’s an unusual career path today, imagine how it played out in 1908 Los Angeles. Because Anna’s determination to live her own life led her father to disown her, she lives in a dump in which leftover trappings of her former lifestyle fight for space with tins of sardines and packages of Cracker Jack—all she can afford to eat on her salary as an LAPD matron. Her former escapades (The Secret Life of Anna Blanc, 2015) have made her notorious, and her police colleagues don’t know what to make of her. She and Detective Joe Singer, son of the police chief, are mad for each other, but Joe wants to marry and have a family, whereas Anna can’t see herself as a meek homemaker following a husband’s orders. After Joe is assigned to Chinatown, he and Anna end up investigating the murder of a childhood friend of Anna’s, a white missionary whose Chinese lover has fled town. Leads are scant in Chinatown’s closed society, and Joe realizes that if the news gets out, it could cause riots and deaths. So they must investigate in secret, even as the police deal with two Tongs on the edge of war. As Anna grapples with the pain of seeing Joe court other women, Joe struggles to keep Anna away from Chinatown and out of trouble. It’s an impossible task, for the brave and often foolhardy Anna, who hates injustice, throws herself into her quest with abandon. Freezing mountain searches, dangerous opium dens, and water rescues are all in a day’s work for the intrepid woman. The feisty heroine's sleuthing abilities and tricky love life make it hard to put this fast-paced historical mystery/romance down and leave you wanting more.